My family lived in New Jersey until I was thirteen, when we moved to Texas. Thanks to the powerhouse T.V. series The Jersey Shore and The Sopranos (R.I.P., Tony), we all know about New Jersey’s abundance of hair gel, turnpike exits and Italian food. I don’t think, however, that many are aware that the third state also boasts fantastic produce………although the fact that it is called The GARDEN State should be a clue. The local produce that we enjoyed during my summers in New Jersey was particularly memorable: ears of grilled super-sweet Jersey corn, thickly sliced beefsteak tomatoes (which my dad always sprinkled with salt), strawberries that we had picked ourselves and juicy freestone peaches. On some muggy summer nights, we would make an entire meal out of tomatoes and corn, finished with a dish of sliced peaches–simple, satisfying and refreshing. At our roadside farm stands, my mom would buy bushels of peaches, which she would peel, slice and freeze for us to enjoy all year long, thawed and baked into crisps or spooned over ice cream. She loves peaches as much as I do (I even have an entire Pinterest board dedicated to them! ), so whenever I am lucky enough to find good peaches in Las Vegas–usually at Trader Joe’s or Whole Foods–I always think of her and what she would do with them. I went to Trader Joe’s last week and, eureka! !, they had flats of perfectly ripe peaches stacked at the entrance. I bought two, not considering that fact that I would be leaving for a week in Wyoming just a few days later. Oops. I had some options: 1. Eat nothing but peaches for the next two days. 2. Pit, peel and freeze, mom-style. 3. 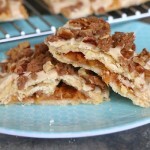 Do a whole lotta peach-centric baking for my blog. Although option one would have most likely be possible (I can eat a lot of peaches), and option two was probably the most logical, I think that we all know which option I chose. In other words, prepared yourself for a plethora of peach recipes over the next few weeks. Today is my mom’s birthday, so I am dedicating this first peachy-keen recipe to her. 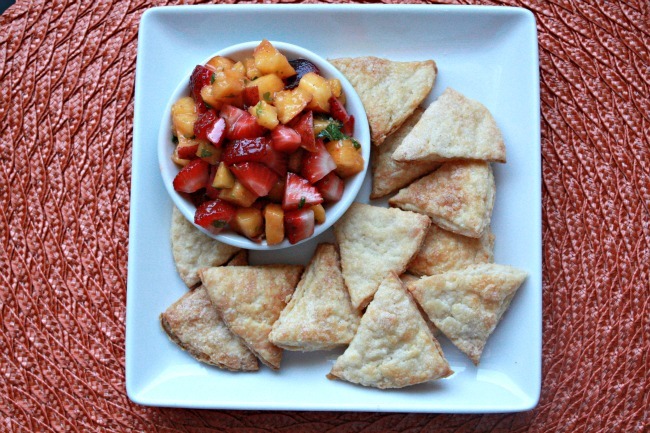 I was trying to think of fun things that I could do with a peach salsa recipe, so I experimented with my All-Butter Pie Dough to create a sweet play on savory chips and salsa. 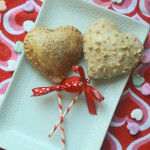 The flaky pie crust triangles, sprinkled with cinnamon-sugar, serve as the chips. It’s almost like a deconstructed piece of pie! 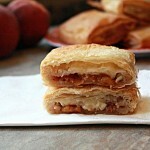 More peach recipes to follow…….. This recipe is a playfully sweet twist on your standard chips and salsa. 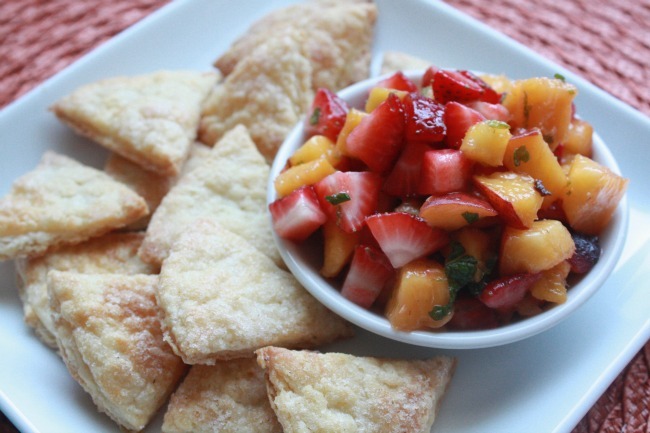 Buttery, flaky pie crust is paired with a strawberry peach salsa coated in a citrus mint dressing. 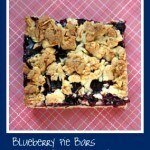 Serve it at your next barbecue for a lighter dessert option. In the work bowl of a food processor, pulse flour, sugar and salt to combine. Scatter butter pieces over the flour mixture and pulse the processor several times, until the butter pieces are the size of peas. Transfer the mixture to a large bowl. Add half of the buttermilk to the flour mixture, stirring with a fork to combine. Add more of the buttermilk, 1 tbsp (15 mL) at a time, just until the dough begins to hold together in moist clumps, adding more buttermilk by the teaspoon (5 mL) only if necessary. Shape the dough into a ball, then transfer it to a large piece of plastic wrap and flatten it into a disk. Wrap the disk tightly in plastic and refrigerate for at least 1 hour before using. Place the sugar, mint, orange juice and lime juice in the bowl of a mini chopper or food processor; pulse until the mint is finely chopped. Combine the strawberries and peaches in a medium bowl. Pour dressing over and toss to coat. Cover and chill until ready to serve. Preheat the oven to 375F/190C, placing racks in upper and lower thirds positions. Line two baking sheets with parchment paper. On a lightly floured work surface, roll out pie dough to a thickness of about 1/8-inch (3 mm.) Using a 5-inch (12.5 cm) round cutter, cut dough into rounds, rerolling scraps as necessary (see note). In a small bowl, mix together sugar and cinnamon. Using a pastry brush, lightly brush the tops of each round with some melted butter, and then sprinkle the rounds with cinnamon-sugar. Cut each round into six even wedges to make the "chips." Place the chips on the prepared baking sheets, spacing slightly apart. Bake chips until golden brown and flaky, rotating position of baking sheets halfway through, 14-16 minutes. Let chips cool completely on baking sheets. Serve alongside salsa for dipping. If you prefer larger "chips" for dipping, cut out rounds using a larger cutter. This would be a great dish to bring to a party! I’m looking forwards to seeing the peach recipes posts to come. I’ll be adding this dish to my “To make” list, I’m sure my family will enjoy it. Thank you, Tina!! I thought it was a fun and different idea for a party. Hope you enjoy! !